Lee will make your child’s birthday party magical! What do the Birthday Party Packages consist of? Lee Curtis comes to your party dressed as a Wizard, a friendly looking Wizard. 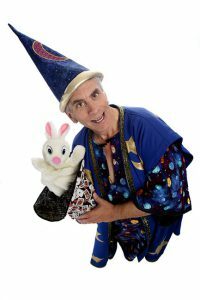 During the Magic Show he will use lots of audience participation, where the children come forward to help Lee do the magic. Sometimes the Magic happens right there in their own hand, which of course makes it very special and memorable. Towards the beginning of the show Lee will invite the birthday child to come forward to assist, as a matter of fact, the birthday child’s assistance will be rather special, and they will shine in he limelight, and feel like they are the star of the show. There also is a theme that runs through the entire show that keeps reminding the party guests that “we are here to celebrate ___________’s birthday” and as such the birthday child will feel special all through the show!! Lee Curtis’s character can be best described as absent-minded & bumbling Wizard, where things go wrong for him in a magical funny way, and then it is the kids who make everything turn out okay, by yelling out the “magic words”. This way they are all participating throughout the entire show, even when sitting down. It is a very interactive type of show. The Most Amazing, Dazzling and Unforgettable Day of their Life! 35 minute magic show, no balloon animals, no floating child trick, no free goody bags. You can still purchase some if you want. 45 minutes of magic & entertainment with optional balloon animals, plus 8 free magic goody bags. There is NO child floating in the air illusion. Keep in mind, it takes an average of 1 minute to make each balloon animal, and that the balloon animals are part of the 45 minute program, so the more kids there are, the less magic that is done. For example 20 kids at the party = 25 minutes of magic & 20 minutes of balloon animals, or 30 kids at the party =15 minutes of magic & 30 minutes of balloon animals. 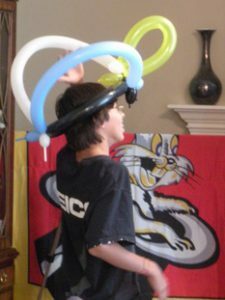 NOTE: Balloon animals are optional, you can chose to opt out of the balloon animals, and then it will be just 45 minutes of all magic. To opt out you must let Lee Curtis know before he begins to set-up for the show. The “Birthday Party Package” is 60 minutes of entertainment, in which during the Magic Show, Lee Curtis, will FLOAT a child in the air! Keep in mind, it takes an average of 1 minute to make each balloon animal, and that the balloon animals are part of the 60 minute program, so the more kids there are, the less magic that is done. For example 20 kids at the party = 40 minutes of magic & 20 minutes of balloon animals, or 30 kids at the party = 30 minutes of magic & 30 minutes of balloon animals. NOTE: Balloon animals are optional, you can chose to opt out of the balloon animals, and the it will be just 60 minutes of all magic. To opt out you must let Lee Curtis know before he begins to set-up for the show. Lots of Great Giveaways, each of the children get a little magic trick to take home with them, it’s a very self-working trick, so even the youngest guests can do it. During the magic show, one of the children made a bunch of super balls appear, and they each get one of those at the end of the party, and they think they are cool, because, one of their friends made the balls appear by “magic”. Also during the Magic Show, Lee Curtis will make balloon animals for each child at the party if you have ordered Gold or Platinum packages. Contact the Magical Wizard via online request form or call 1-800-436-8749. Lee Curtis serves areas between Fort Collins to Colorado Springs. Other areas available but are subject to slightly higher pricing for nominal travel expenses. "Thank you for doing such a FANTASTIC job entertaining all of us at my children's birthday party! The adults enjoyed it as much as the kids did! You amazed us all with your magic and amused us with your funny antics!" "Thank you for a great show, I can't believe how you held their attention for an hour like that, it was truly magical!"